After Buster is mistaken for a wanted murderer, he finds himself on the run from the terrified citizenry and the determined police department. Mistaken identity and cruel fate abound in The Goat (short for scapegoat). It opens "along millionaire's row:" a breadline. Keaton tries to cut in front and get sent to the end. He confuses two tailor's dummies for the end of the line, and the queue moves up without him. Even though the dummy doesn't react to Keaton's jab with a pin (which proves effective on himself), he stands and waits. Fearing rain, the tailor moves the dummies inside. Keaton runs to catch the line, but naturally the window closes just when he arrives. Next, a prison guard escorts Dead Shot Dan (Mal St. Clair) to a photographer for a mug shot. Keaton peers into the barred window behind Dan. While the photographer is distracted, Dan leans forward, takes Keaton's picture, and hangs his hat on the lens to prevent a double exposure. After the photographer snaps the shutter, the guard leads Dan to the hallway where he turns out the light and escapes. Meanwhile, Keaton idly kicks a horseshoe. A dandy picks it up, spits on it, and throws it over his shoulder. He immediately finds a wallet stuffed with money. After a desperate search, Keaton finds it, douses it with saliva, and heaves it backwards - right into a cop. The chase begins. After hiding behind a wooden Indian that turns out to be human, Keaton finds a second cop to shove into the first one. Next he hides behind a traffic cop, matching his arms to the officer's signals. It works until the traffic cop leaves. The first two spot him and the chase resumes. Keaton hides beneath a car, which rolls forward and exposes him. He grabs the spare tire, and gets dragged to a fourth cop who helps him up. Cops one and two catch up, and Keaton runs. Finally he makes a stand: he removes his jacket and offers to take them on. A train intercedes between them and Keaton walks away. He puts his jacket back on, but manages to include a signpost up the back. Cop number five (Eddie Cline) strolls along, and Keaton assumes he's been nabbed. He makes a break for it, turns to look, and finds that the indifferent cop has wandered off. He calmly collects his jacket. The train finally passes, and the three cops go after the hero. He climbs through a truck and onto its roof. The police hop in and Keaton secures the door behind them. It drives away. Next, a cad becomes entangled with a woman (Virginia Fox) and her dog. Keaton runs to the rescue, knocking him cold. He runs away when a sixth cop arrives. As he hurries down the street, the truck backs up and the three cops tumble out in front of him. The chase resumes. Keaton runs to a train car, climbs on, and waves good-bye -- but the train moves without him, because the car isn't attached. He scrambles to catch the moving train, runs through the car with the police in pursuit, and detaches the car, stranding the cops and passengers. He waves a final good-bye. The train races down the tracks, pulling up and stopping at the camera for Mr. Keaton's close-up (he's seated on the cowcatcher). He lights his cigarette on the hot engine, and jumps off of the train where he sees the engineer's surprise at the lack of cars. People meander about the train station; Keaton approaches one man reading the newspaper. 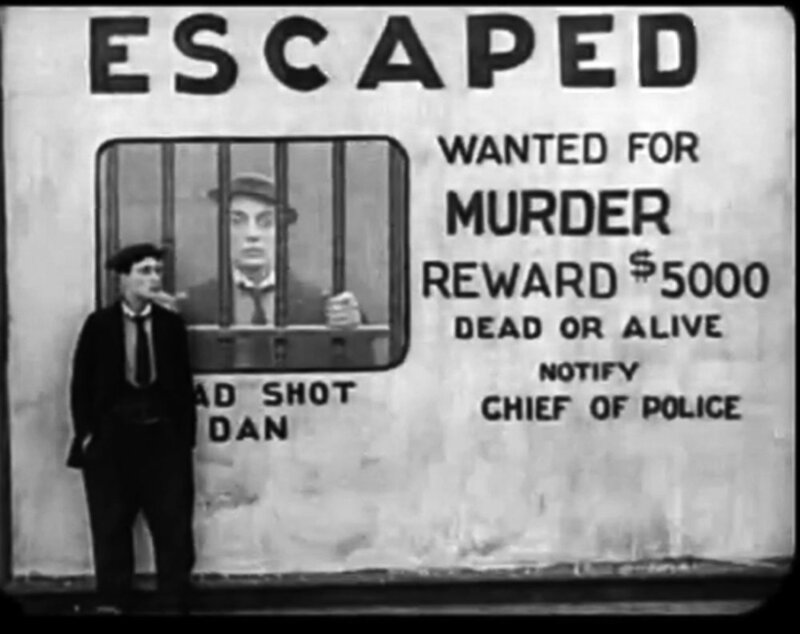 Keaton's picture appears next to the headline "Dead Shot Dan Escapes." The man runs in terror at the sight of Keaton, as does everybody else. He checks a mirror but can't see what's wrong. He goes into a crowd around a large wanted poster; they quickly disperse and he sees himself. He realizes (via flashback) that he killed the cad. A ghost confirms this (he's actually a construction worker covered in mortar). Frightened, Keaton runs right into a plainclothes policeman (Joe Roberts). The officer's suspicions are aroused, and he doesn't notice a criminal's aborted attempt on his life. A constituent interrupts his ambling pursuit of Keaton. Keaton returns to the wanted poster, and fastens an abandoned fur collar to his photo as a moustache. The policeman arrives and compares Keaton to the poster. The 'moustache' droops and Roberts pulls it off. As Keaton inches away, the criminal shoots at the policeman and hands the gun to the goat. Keaton explains that it wasn't him, the gun goes off again, and he runs away. He climbs into what appears to be a car's spare tire, but the car drives away, abandoning him in a sign for vulcanizing. So he runs into a receiving hospital and lies down on a gurney, covering himself with a sheet. When Roberts follows an orderly orders him out. The orderly rolls the gurney into an operating room and tells the nurse that the doctor will operate at once. A construction worker comes in and sets his tools on top of the patient. After a look at the tools, Keaton leaps up and out the window and onto the sidewalk, where paramedics load him onto a stretcher and carry him past a dejected Roberts back into the hospital. Keaton promptly gets thrown out the door and lands next to him. The chase heads into a park. An artist speaks in front of a covered, life-size clay model of Man of War. Keaton mingles with the audience, disappears, the reappears when the artist removes the cover. He's astride the horse. The clay slowly gives way; Keaton leaps off and slides under a wagon full of rocks. He eggs Roberts on to follow, climbs out, and dumps the rocks onto the cop. Later, after admiring his portrait as Dead Shot Dan in a newspaper, he sees Fox whom he'd gallantly rescued earlier. A taxi driver tries to interrupt, but Keaton shows him his picture in the newspaper and he leaves quickly. Keaton carries her bag to her apartment, where he meets her mother and is asked to dinner. All is going swimmingly until after they start eating: father gets a good look at his daughter's new friend. He's the policeman. Roberts sends his family out of the room, locks the door, mangles the key, and comes after Keaton. Keaton uses him as a springboard to leap through the transom. He runs to the telephone booth and sinks down, as if it were the elevator that's next to it. Fooled, Roberts races for the stairs. Keaton goes into the real elevator, making it come faster by turning the floor indicator dial. The officer is waiting for him at the bottom, so Keaton rides it back up and goes into a man's room. The man has the newspaper with Keaton's picture. As he holsters his gun his policeman's badge is revealed. Wisely, Keaton runs out and up the stairs. He disposes of the second officer down the elevator shaft (Keaton steps into the 'elevator' and stands on the ledge; without the car the officer plunges seven floors). Keaton phones Fox, asking her to meet him on the second floor. Roberts appears and Keaton tries to sink again, this time to no avail. He escapes by sliding through Roberts' legs and takes the stairs to Fox. Her father takes the elevator. Keaton and Fox hide as Roberts strides out, and they take the elevator down and get out. Roberts follows. Keaton first hammers a nail into the floor indicator so it won't descend below the second floor, then he twists the dial past the top, causing the car to shoot out the roof. Keaton and Fox skip out of the building amid falling roof debris. They pause in front of the Hollywood Furniture Co. and read the sign: "You furnish the girl, we'll furnish the home." He throws her over his shoulder and they go in.